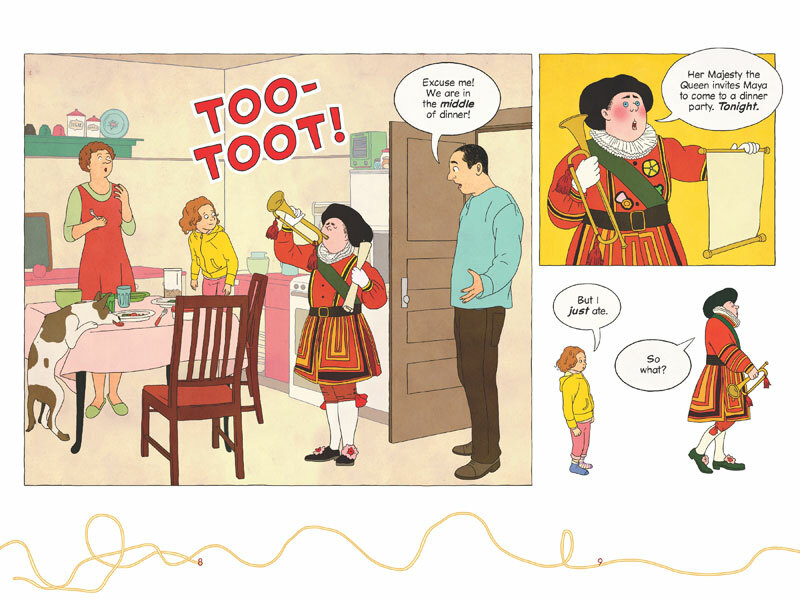 Maya Makes a Mess by Rutu Modan is my favorite new TOON Book. Honestly, though, every new book that TOON publishes is my favorite. However, Maya Makes a Mess has one of my all-time favorite things in it - spaghetti. The colophon has all the production notes printed on a giant pasta pot overflowing with spaghetti, à la Curious George and his kitchen job. From this pot, a tangle of pasta makes its way along the bottom of every page of this wonderful book. 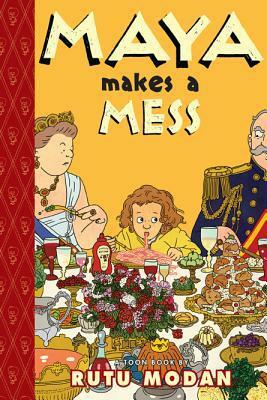 As the first pages of Maya Makes a Mess illustrate, Maya can't seem to do anything right at the dinner table. Frustrated and scowling at her father, Maya asks why she has to follow all these rules a the table, to which her father responds, "You need manners! What if you were eating dinner with the QUEEN?!" Not a second later, the doorbell rings and . . .
A royal welcome awaits Maya. Modan's book is filled with details, from the private jet ride to the palace, to Maya's mismatched socks to the Queen's corgi dogs. Each page is rich with images readers will pore over long after they have read the text. Dinner is served and, in addition to the odd, yet fancy array of foods served, Maya finds herself more than a bit overwhelmed by the folded napkin on her plate. When she manages to have a servant bring her a plate of pasta with ketchup, she is then stumped by the battalion of silverware that flanks her plate. I wish I had an interior image of this page to share, but you just might be able to imagine it. Unable to decide which fork to use and told by the royal gentleman to her right that, "There is no pasta fork," Maya decides to eat it the way she knows and loves best. Of course all eyes turn to her. Astonished, the Queen asks Maya if anyone ever taught her manners. When she answers in the affirmative, the Queen questions again, "Then why, for heaven's sake, do you eat that way?" Maya's answer? It's what makes Maya Makes a Mess a keeper. I almost don't want to divulge what it is here. I can tell you that your kids will LOVE it and the Queen gets pretty crazy with a bottle of ketchup. 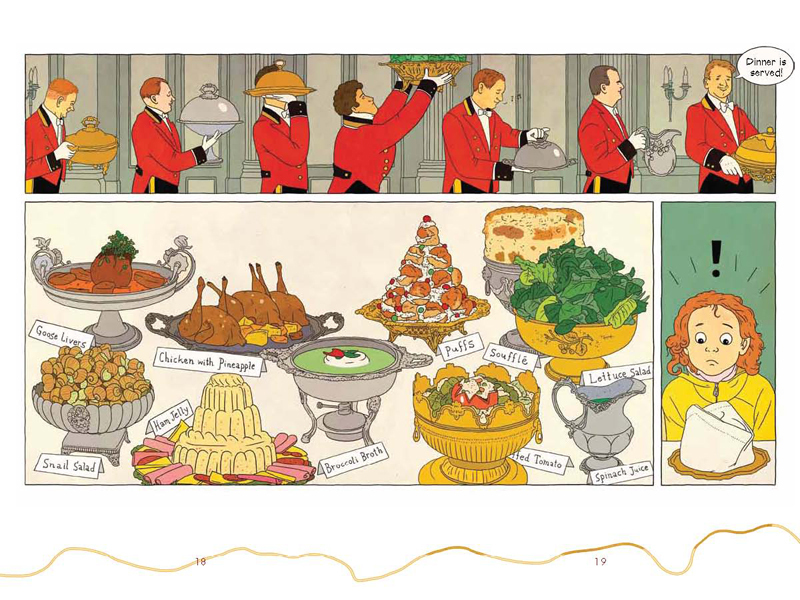 What I especially love about Maya Makes a Mess, beside the great story and fantastic illustrations, is the author's note at the end of the book in which it is revealed that Rutu liked ketchup so much as a child that she even ate it on cookies and straight out of the bottle when her parents weren't looking. 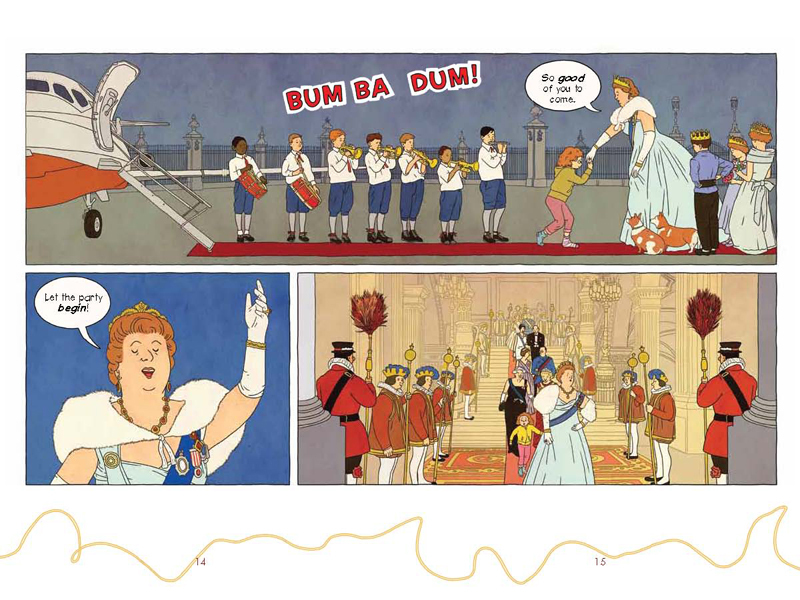 When Rutu's daughter was young and her table manners were horrible, Rutu asked her what she would do if the Queen invited her to the palace? Michal answered, "Well! It just so happens that the Queen is a VERY good friend of mine, and she told me that I eat perfectly." Maya Makes a Mess is definitely a book your kids will want to read over and over again.